Wesleyan is one of the premier liberal arts schools in the country, and its distinctive qualities have great appeal to both students and faculty. With regard to its peer institutions, however, the university’s endowment per student does not measure up. Wesleyan has learned to use its resources for maximum effect, or, as President Roth often puts it, to punch above our weight. That keeps us fit, but it doesn’t obviate the need to secure Wesleyan’s future with an endowment that better supports our aspirations. Since as recently as 1981 Wesleyan’s endowment was roughly equal to those of peer institutions, the question often comes up: what happened? In the 20-year period beginning in 1978, Wesleyan’s return on the endowment was solid—only slightly below the group mean of some of the highest performers among our peer institutions. Our draw on endowment, however, was often greater than theirs, sometimes significantly. While spending has been a factor in our relatively weak endowment growth, the largest factor has been inadequate gifts to the endowment and therefore less compounding of endowment value. During 1984-2004, Wesleyan raised $105 million in gifts to the endowment. The more successful peer institutions raised roughly three times that amount. Strong equity markets compounded the disparity to such a degree that by 2005 seven liberal arts colleges—Williams, Grinnell, Wellesley, Pomona, Swarthmore, Amherst, and Smith—had endowments topping $1 billion. Wesleyan’s was approximately $565 million. Wesleyan’s last campaign, which raised $281 million, demonstrated the ability and desire of Wesleyan alumni and parents to support the institution. That campaign raised $75 million in direct contributions to the endowment; the rest went to annual operating support, including current-use gifts for financial aid, and other projects. During the past decade, Wesleyan also took advantage of low interest rates to help finance its program of campus renewal. By 2005 Wesleyan had borrowed $200 million for campus enhancements. We have much to show for it, and many of our facilities are great competitive assets. Our fundraising has been strong, regularly exceeding $30 million per year in cash raised, thanks to the generosity of our alumni, parents and friends. We have, however, directed too much of our gift income to current operations at the expense of endowment growth. We are changing our practices to put our economic house in order. To that end, we have set a goal of directing no more than 25 percent of gift income toward operating expenses. This is a significant change—past practice was more or less 25% endowment and 75% operations. Our new goal aligns us much more closely with our peers. It’s clear that if we expect to remain competitive with the nation’s premier institutions over the long run, we must do a better job of growing the endowment, and we have begun to do so. Sound fiscal management has been essential for reducing the draw on the endowment. We now operate in the 4.5%-5.5% range approved by the Board. We have reduced staff positions by about 10% (primarily through attrition and a voluntary separation program), and we are implementing many other changes that will reduce our base budget by $25 million without detracting from our core educational mission. We will not add to Wesleyan’s debt, but we are taking steps to fix the rates we pay. We are committed to maintaining fiscal discipline and limiting our endowment draw. We have done a lot to reduce expenses, and we will continue to search for efficiencies in operations that enable us to cut spending in ways that do not have an effect on the experience of our students. Guided by the advice and oversight of the Portfolio Subcommittee of the Board, we are currently speaking to various individuals and firms about the management of our portfolio. Later this spring, we will report to you on the outcome of those discussions. Endowment is the means by which investors in Wesleyan have a lasting impact on the success of the institution. Through gifts to the endowment, fiscal discipline, and prudent management, we will ensure that Wesleyan continues to offer a liberal arts education second to none. This is an updated chart that replaces an earlier one, with thanks to readers for their comments. Thanks for the frank and clear assessment of the endowment. The course of action — using more gift money to restore the endowment — is sound. One question: if we divert gift money from current operations to the endowment, are the cost savings measures discussed above sufficient to make up the shortfall? Will we be able to maintain the levels of service in our current operation or will we have to raise tuition materially? I say this not only as a concerned tuition-paying parent, but as a loyal Wes alum who recognizes that our tuition is already one of the highest nationwide. I am looking at the chart, and am wondering what happened to the 2003 data? It is not customary when charting to have non-uniform axes (except log-normal) without noting the break. So is there a reason that the 2003 data is not provided? Was it not collected at all of these institutions for some reason? Or is it omitted for other reasons? 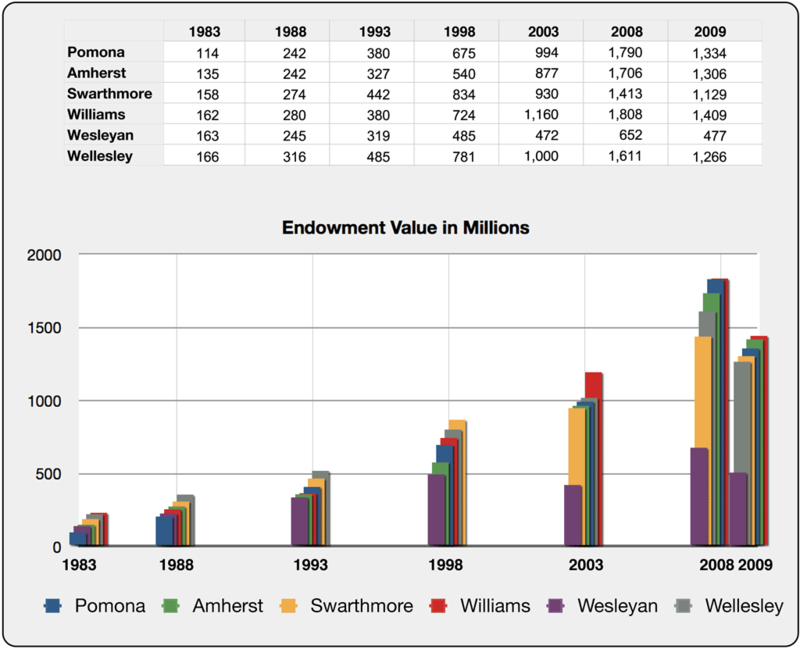 Clearly, there was already a trend of Wesleyan’s endowment slipping compared to its peers since 1983, but from 1998-2008 shows the most dramatic changes. And of course, that period of time also encapsulates some of the most volatile periods in stock market history – from the rise of the tech boom, the dot com bust, 9/11, the war in Iraq, the subsequent recovery, and the credit crisis. While I do not have any information to cite reasons for the slippage, I am having trouble believing that “the largest factor has been inadequate gifts to the endowment and therefore less compounding of endowment value.” While it is true that a smaller gifts result in less compounding in absolute terms, analysis of the endowment numbers by percentage shows a different story. Even while Wesleyan’s endowment growth had been lower than its peers, it had managed growth rates of 96% from 1983-1993 and 98% from 1988-1998. The ten year period from 1998-2008 only shows a growth of only 35%!!! Has gift-giving in percentage terms dropped THAT much during that ten year period? Of course, I don’t have any data except from the table and chart above, but as a financial analyst, I am wondering if a large reason for underperformance during 1998-2008 is due to poor investment management during the turbulent times. Perhaps that aspect needs to be investigated more thoroughly, and perhaps changes should be made there as well. Having served on the Finance Committee of the Board from 95-97, I recall that the Board voted to change both the spending cap and the nature and balance of investment vehicles in the endowment portfolio at exactly the point on the graph where we depart most radically from our peer institutions. Both faculty members and both student members of the Finance committee abstained from voting on that proposal, as none of us supported those changes. Apparently, we had sounder fiscal foresight than the money managers on the Board at the time! Either that or those “alternative investments” really turned out to be dogs. I am glad to see Wesleyan returning to a conservative policy in this area. I agree that Wesleyan’s tuition is high, whether or not it compares to our peers’. Some of us dream of the day expendable endowment yields would cover all tuition for all students. I do believe at some level it’s important to make very detailed comparisons with our peer institutions such as endowment giving and performances – or looking at the endowment resources made available per student (a simple calculation using the number of students). Some of these can also be misleading, however. Swarthmore, for example, has a long history of very conservative spending, raising questions for some professional foundations whether they should give to schools who keep more than they can. Also, they have many fewer students, and many more fewer from minority groups. It’s a different place. Amherst’s endowment, I recall reading, has a large percentage tied to its Folger Shakespeare Library. Ours may, in practice, be more evenly distributed among our library and other resources. And their student body character has also differed significantly from ours; so much so that you might join me in surmising that a large segment of our students — past and future — wouldn’t have chosen nor likely choose there to here. And if you look at how well we’re doing in attracting great students (faculty and administrators, too) year after year, the picture looks even better: the numbers keep going up, we keep bettering ourself. And in any practical estimation we’re a wonderful school. Students are treated to four years of a truly wonderful place to live and learn. In the end, I think we set our own standard and push its limits because its the right thing to do. Not so much because of how we measure up to others. We should continue to tap greater giving, of course, but ultimately because of all we do. A final note, clever how the graph avoids Red for that low-lying line. But I wouldn’t have swapped colors with Williams for anything. We’re the Red and Black and darn proud of it! I really applaud President Roth’s efforts to address two difficult “generational issues” that have frustrated/plagued the University for the better part of 25 years – (a) enlightened gifting and (b) appropriate investment management. Yes, we need to continue to develop and enhance a culture of giving that regularly ranks us close to the top of our peer group (i.e. 57-60% participation rates for the ENTIRE growing alumni base) because all of us receive an outstanding education on which to build interesting careers in diverse fields! In addition, knowing the investment business as I do, we cannot cry over the spilled milk of endowment misallocation/underperformance from 1993-2008 (note: we clearly did not have the level of commitment to alternative investments in QUALITY hedge funds and private equity vehicles that our peer institutions had over that 15 year time horizon!). We have to trust in Michael’s leadership and look forward to significant improvement on both fronts – plus perhaps a transformational gift of $75-100 million from a few key alum – before we can have a level playing field in the endowment arena. Thank you, Joseph, for your thoughtful reply. This article takes for granted that it is important to have a large endowment that is competitive with our “peers.” What benefits we might gain from diverting money away from current needs are unstated. If we took, say, Harvard as our example, it seems the larger the endowment, the larger the opportunity for the shysters running our absurd and fraudulent financial system to squander donors’ money. Wesleyan need spare no expense to preserve the opportunity for any qualified US kid to earn an education that changes not only her life, but ours. The endowment is a major issue, I think we need a greater sense of urgency. Otherwise we could come to visit and find only the Wesleyan Residential District or the Wesleyan State University. I hate to say it, but Wes has to be more careful with giving financial aid. Remember that in giving financial aid you often pay twice: students who depend on financial aid rarely have the funds later to be major donors, even if they are fanatically pro-Wesleyan.